The reaction from our old friend Simon Cowell makes it worth the wait. SO, we received an email from Paypal...hehehehe...surrrrrrrrre it was! Check it out..if they had stopped after the first paragraph their credibility might not be in question. Security Assistance It has come to our attention that your account information needs to be updated as part of our continuing commitment to protect your account and to reduce the instance of fraud on our website. If you could please take 5-10 minutes out of your online experience and update your personal records you will not run into any future problems with the online service. . However, failure to update your records until JUNE 18, 2007 your account considered as suspension. Please update your records as soon as this email being sent. Once you have updated your account records, your session will not be interrupted and will continue as normal. as soon as possible. Allowing your account access to remain limited for an extended period of time may result in further limitations on the use of your account and possible account closure. OK KIDDIES, what do you think we should do? Do we click on the link in the email??? Do we? YOU'LL BE SORRY...HEY STOP HITTING ME! Is it Friday? Why are we streaming? Average winning bid? $514, 327.71 bringing in a cool $63,776,636.04 for NYC! So after hailing the livery cab he is accused of telling the driver he was an undercover police officer and to not stop for any lights. The cab was stopped 13-blocks later and Mr. The Game was arrested. The Game rejected a Manhattan prosecutor's offer Wednesday of a guilty plea for a sentence of time already served. The guilty plea would be for a misdemeanor charge in exchange for the time he spent waiting to go to court. "Why should he plead guilty to bogus charges for a non-jail sentence if he's innocent," Jeffrey Lichtman, The Game's attorney said outside court. "And he is innocent. It's rare that I have a 100 percent innocent defendant, but this is one." OK KIDDIES, someone remind me to hire this guy...sheesh, what do his other clients think of him now? My question is do you want to go to court and have to defend yourself when you can just walk...a misdemeanor!!!! I'm liking the rambling stream of thought. Reminds me of when I first starting sitting on The Couch. And thanks for the video. That was an amazing performance. I love music on blogs ... from opera to jazz ... both your selections could BLOW hon! Good choices. I have a former student who loves Benny Goodman and has modelled her clarinet playing on his sound. How odd for a 19 year old, huh? That opera guy brought tears to my eyes. Nothing as moving as a decently realized operatic aria. Purely gorgeous timbre to the guy's voice. Higher tenor than I was expecting, though. The quality of his training is obvious, but it's not hard to believe that this guy hasn't already been snapped up, given the rather insular acceptance practices of the opera world. I sure hope this brings him the attention he so richly deserves. SANNI: LOL, I can do that...but but but, I thought I was getting the 33Billion???? clicking the link is fine and dandy, clicking the link and then giving information, not so much. The Simon reaction when he stopped chewing on his pen was priceless. That guy is really good, though Mrs Duck always the cynic, questioned whether it was real. 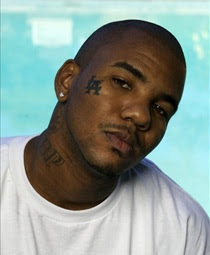 Ahh, the Game, a rapper more famous for getting arrested and throwing some lines in on a cell phone song jingle then for actually selling albums or downloads or howver they track that now. I'm in writhing pain so I'll just say Hi Bond...Hi Bond. Why does everyone think that opera singer was so great? I couldn't understand a work he was singing! I'm with Sadie...I was sure they were going to reveal that Paul was lip synching! I'm such a cynic I guess, just like my beloved Cowell. But that guy was great! I hope he wins. And it's so good to see my evil British love again. I say don't click the link. It could cause ALL kinds of trouble. The voice was totally unexpected & gave me chills...wow. DOC: what? your TV does not have the Opera translation button? MERI: TYTYTY...ARE YOU TALKING ABOUT ME...I SCARE YOU???? I visited in the wee hours this morning as is customary for me, but I didn't get the chance to view the video until now. I wept, for reasons known and unknown. Holy cow.... I hope that guy strikes it big...lol. Yup, yup, yup....I want to hear more from that fellow! Thanks for posting over here my friend! I was by yesterday but didn't have time to comment - so here I go. The flag - a beautiful sentiment my friend. You must feel closer to him in those times. Paul Potts - ok, true triple threat - chills, goosebumps and tears. 'nuff said. No comment on the rapper....absolutely none. And I LOVE that line at the end - but how many things can be named Vinny? ANGELL: I do fell closer...LOL Paul is one of those rare gems...LOL vote vote vote...what voices??? EVERYTHING can be named VINNY! Alright Vinny?! I missed this post but my boyfriend just told me you had posted Paul Potts. Not a fan of opera AT ALL so I can't like this. Travis mentioned him on my post today and I hadn't seen him on the programme. you're a wise one... picked the winner straight off! TOPCHAMP: But as a musician, you have to appreciate the "instrument"